The principles informing the overall form and layout of public streets, roads and paths. 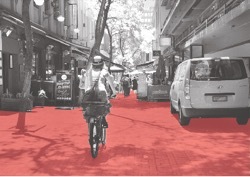 The movement network is the interconnected system of streets, roads and paths that accommodates pedestrians and cyclists, on-road public transport, emergency and private vehicles. The movement network connects places and activities, and allows people and goods to reach their intended destinations and to access private land. Among its many functions, the movement network land area can provide space for utilities infrastructure and car parking, and can also provide access to daylight and ventilation for adjacent buildings. A well-functioning movement network provides optimal walking and cycling access to destinations such as activity centres, work, schools, public transport and parks, and it has high levels of legibility, convenience, amenity and safety for users. Good connections to places and linkages between different modes of transport, ensures equitable access to facilities, services and public transport. The design and layout of the movement network greatly affects people's mobility and travel options as well as their safety and wellbeing. Streets play an important role in enabling people to be more physically active and healthy. Streets also play an important role as public spaces, supporting social interaction and providing places for cultural expression. These guidelines focus on urban design for active transport – pedestrians and cyclists and access to public transport. 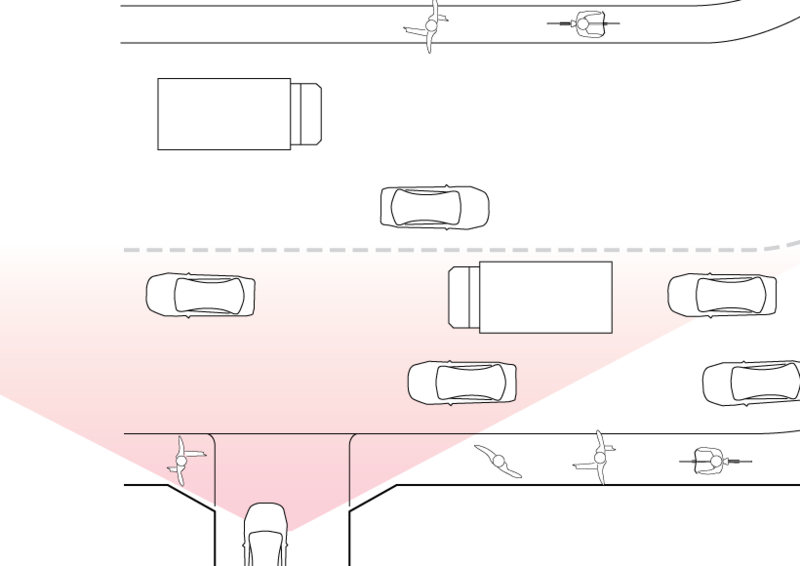 Provision for street design for vehicles is covered elsewhere by civil engineering standards. Provide direct, continuous and well-lit pedestrian and bicycle routes. Provide a pedestrian network that caters for persons of all abilities. Provide for walking and cycling on all streets. 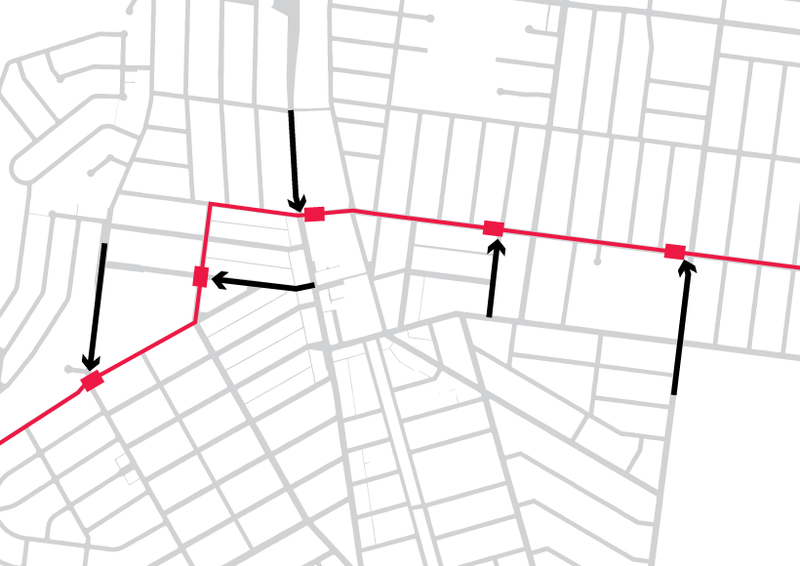 Allocate a street function and mode priority to each street in the network. 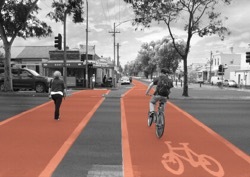 SmartRoads, a tool for assigning priority to different modes of transport, was developed by VicRoads. 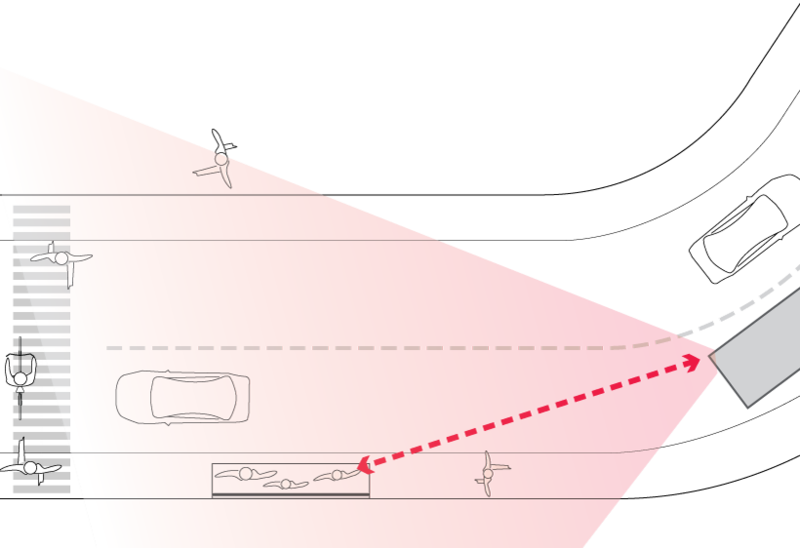 It provides guiding principles for road use by transport mode, place of activity and time of day. See Guideline sources and references. Establish a level-of-service provision for each mode on each movement network section. 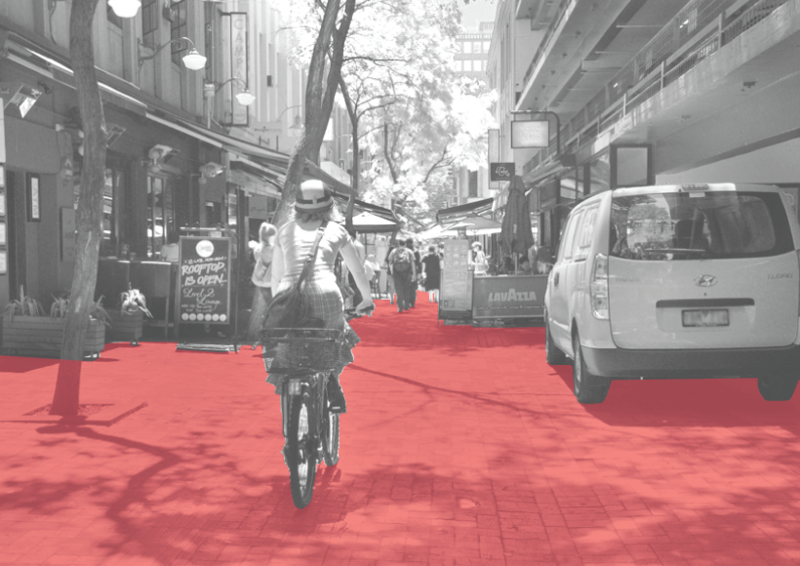 Streets need to allocate sufficient space to accommodate the anticipated volume of pedestrians and	cyclists as well as on-road public transport, vehicles and on- street car parking. For other modes see Guideline sources and references. Maintain clear sightlines to landmarks to assist pedestrians and cyclists to orient themselves and move around an area. 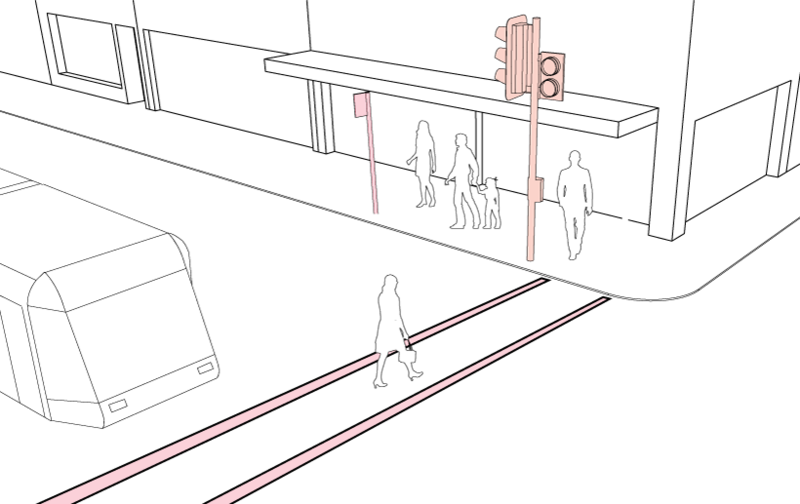 Provide clearly marked, direct and safe connections for pedestrians travelling between movement modes. 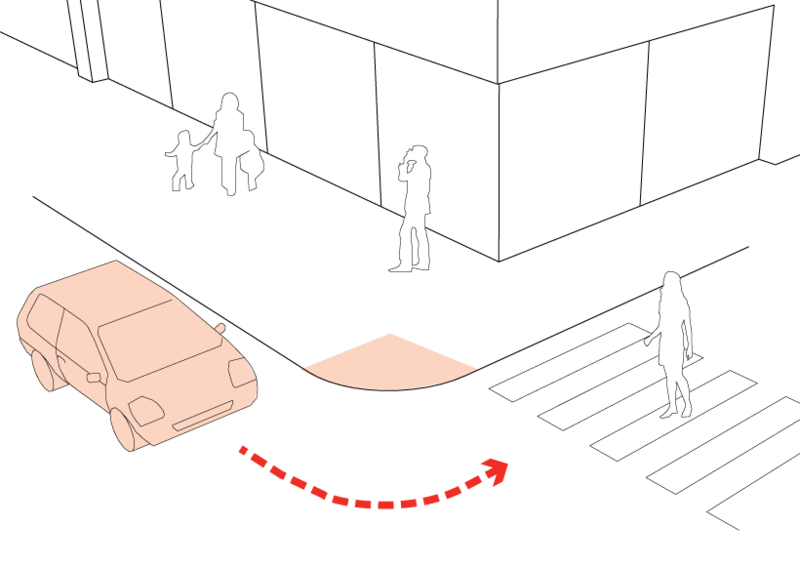 Whenever people move between modes, such as between a parked car and public transport, they are pedestrians. 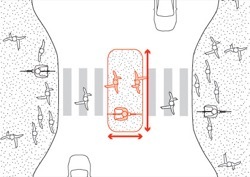 Arrange vehicle crossovers to allow clear sightlines between drivers entering the crossover and pedestrians and cyclists on the path. The movement network is managed by a number of agencies, each with different responsibilities and interests. This adds to the complexity of developing and managing a successful network. Manage the movement network and street space to respond to changes in use patterns and community needs. The movement network can be managed by creating shared zones, vehicle lane controls, pedestrian-only periods, public transport priority periods, variable traffic light phases, parking controls, speed limits, and space for kerb cafés, street vendors and buskers. Schedule periodic reviews of the movement network performance to inform network adjustments. Streets that give high priority to walking, cycling and facilitating social contact, while allowing for low-speed motor vehicle traffic. They are usually in areas of concentrated activity. Pedestrian priority streets give high priority to walking and cycling, while allowing low-speed motor vehicle traffic (under 40km per hour). These streets are usually found in areas of intense and diverse activity such as activity centres, education facilities and public transport interchanges. They accommodate diverse travel modes as well as provide a public space function. 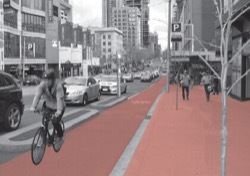 Bicycle lanes may either be provided as a separate lane, or a shared path with other modes. Streets may also restrict vehicle types or access at times. Pedestrian priority streets perform many functions. They are comfortable and safe for all pedestrians, including those with a disability, and provide a safe environment for low-speed cycling. They can also be the setting for informal activity such as performers and vendors. Well-designed pedestrian priority streets encourage walking and cycling. Higher pedestrian numbers support the viability of nearby businesses, and allow uses such as cafes and restaurants to 'spill out' on to the street. Co-locate the pedestrian, bicycle and vehicle paths. 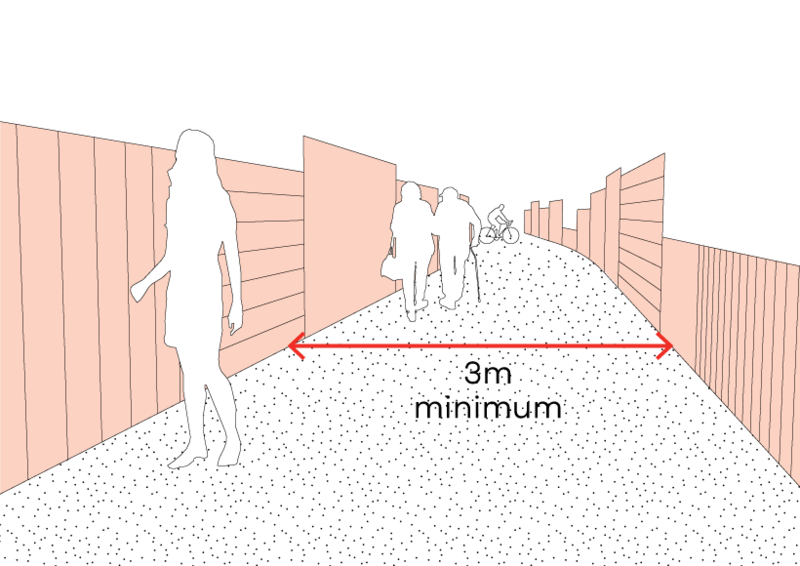 Locating mode paths side by side increases the likelihood of informal surveillance, as there are more people on the street, more of the time. When pedestrian-only malls and separated pedestrian paths have low levels of activity they can feel unsafe. 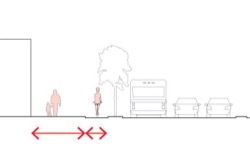 Allocate a greater portion of street space to pedestrians and cyclists. Pedestrian priority streets work best with high levels of pedestrian traffic and of activity within adjacent buildings. 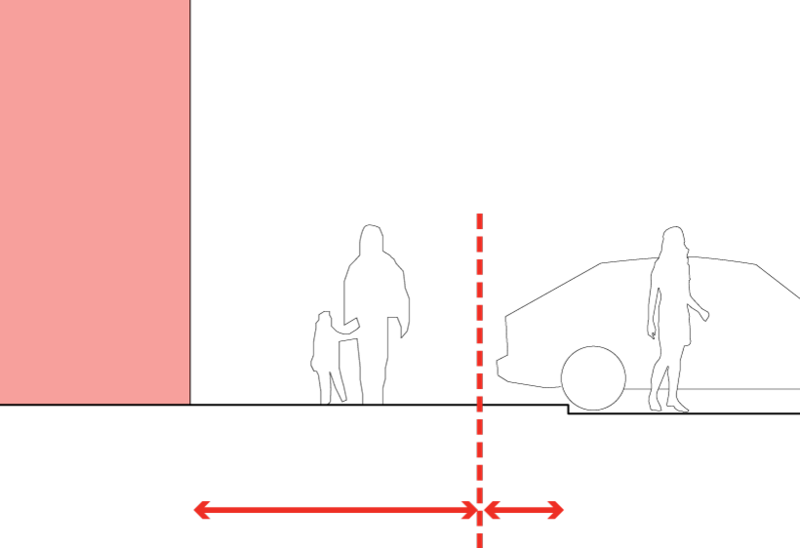 Where there are high numbers of pedestrians and low numbers of vehicle movements, create a ‘Shared Zone’. If an existing street or lane is too narrow to provide a footpath that complies with Disability Discrimination Act requirements there may be no option but to treat the street as a ‘Shared Zone’. Keep the kerb radius at intersections to a minimum to encourage vehicle traffic to slow down when turning left into side streets. The kerb radius should be kept to a minimum compatible with street cleaning, bus movements and road safety requirements. See Guideline sources and references. Place doors and windows of buildings to overlook the street. 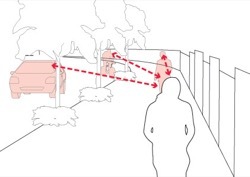 Include splays to driveway exits from laneways, buildings and car parking facilities to maintain sightlines from vehicles. See Guideline sources and references for VicRoads Supplement to the Austroads Guides to Road Design. 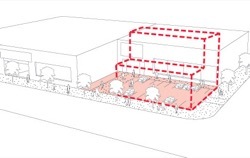 Provide space within the street for activities that support adjacent uses. 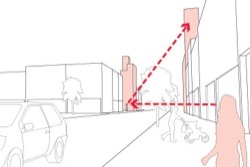 To attract pedestrians, streets need to provide a high level of interest for users. 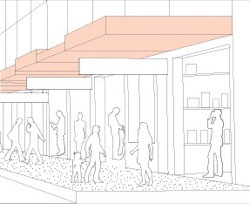 Street spaces can accommodate outdoor dining, vendors, public art, performance and recreation. 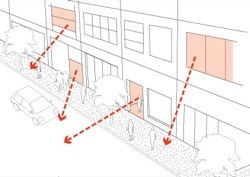 Where possible integrate shelters and awnings onto the building facade on pedestrian priority streets. 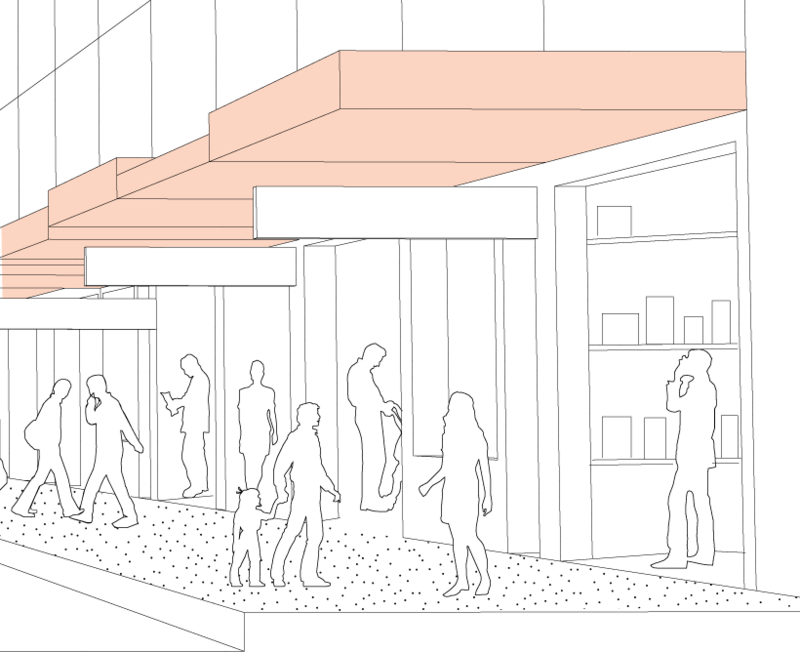 Integrating shelters, by attaching them onto the building wall, allows the street spaces to remain uncluttered. Building Code of Australia sets out design standards for building projections beyond the street alignment. See Element 5.1 Buildings in activities areas, and Element 6 Objects in the public realm. 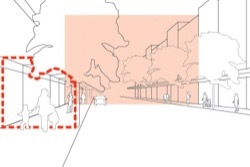 Use street width, building height and landscape design to create a sense of enclosure for street users. 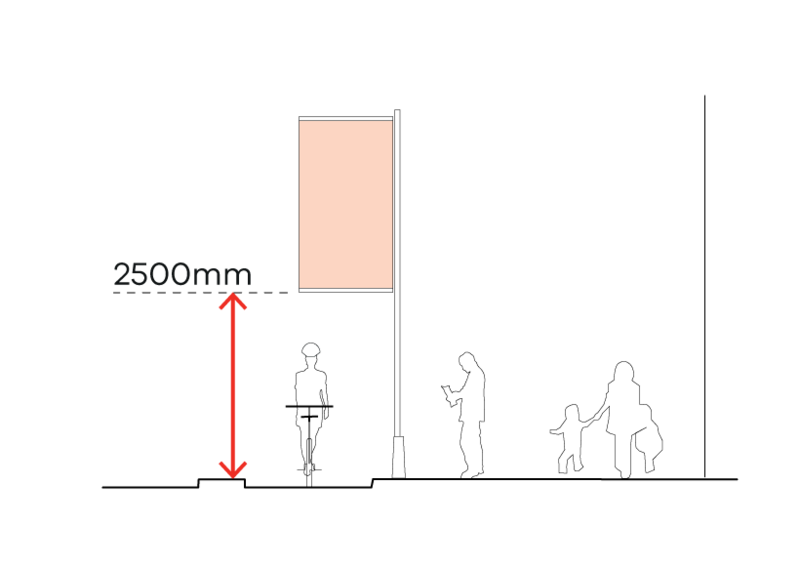 The ratio of building height to street width can affect pedestrian activity. Narrow streets can encourage pedestrian activity. See Element 5 Buildings. Arrange the street furniture and finishes to emphasise the pedestrian space. Emphasising pedestrian spaces, for example by using entry markers and changed paving, sends a message to all street users that pedestrians are the priority. 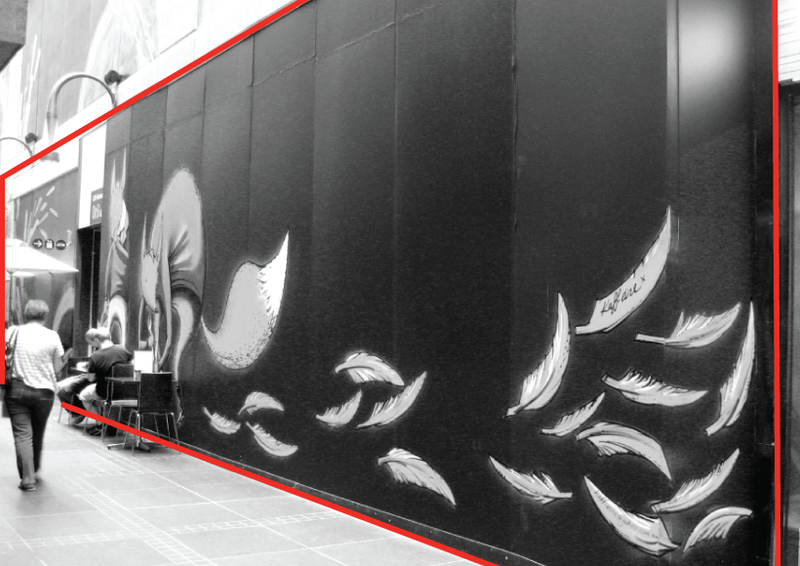 Implement programs to facilitate and manage activities in the street space. See Element 3.2 Street spaces and plazas. 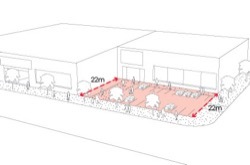 Enable adjacent businesses to use the street space for café furniture and to display merchandise. 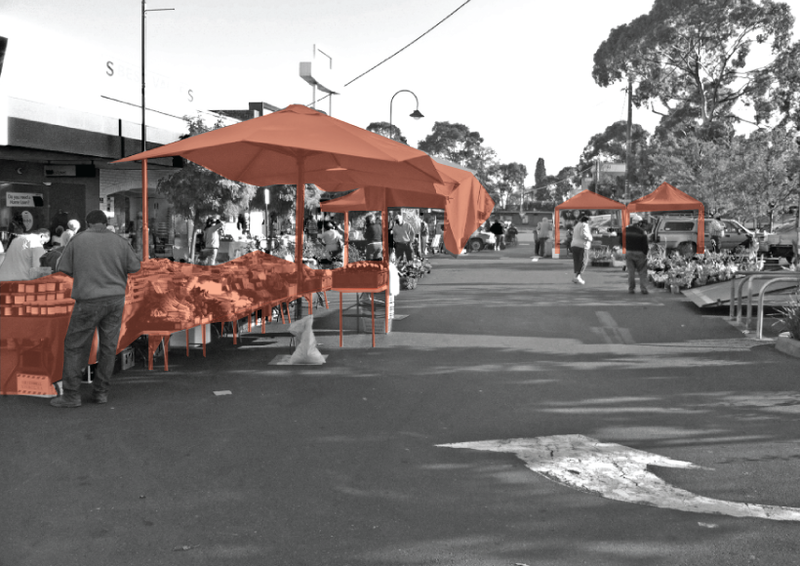 Kerbside dining brings activity into the street. Increase the street space available for social activities as demand increases. Implement programs to enliven blank building walls. Architectural detail, wall art, lighting and advertising can transform windowless walls into attractive facades. Design streets to facilitate efficient maintenance. Poorly maintained streets are known to influence perception of safety. Promptly remove graffiti and replace damaged furniture. Damaged public furniture should be quickly removed and replaced to reinforce care and the perception of a safe environment. See Element 6 Objects in the public realm. Paths that provide for people moving on foot, bicycle or other mobility aid vehicles within streets or public and semi-public spaces. Pedestrian and bicycle paths specifically provide for people on foot, bicycle or other mobility aid vehicles. Paths may be located on local streets and major roads, in public spaces such as parks and reserves, or through semi-private spaces such as car parking lots, forecourts and arcades. Paths may be solely for pedestrian use, cyclist use, or shared paths for pedestrians and cyclists. Pedestrian and bicycle routes should connect people directly with local destinations such as schools, shops, train stations and parks. Convenient, safe and comfortable pedestrian and bicycle paths are a valuable part of the movement network, and act as more than just thoroughfares. Footpaths are multi-use environments where people socialise, conduct business and observe the world around them as well as travel from one place to another on foot. Pedestrian and bicycle paths are also very important in enabling people to be physically active. Pedestrian and bicycle paths are most inviting when they are direct, highly visible and well sign-posted, offer shade, seating and end-of journey facilities. 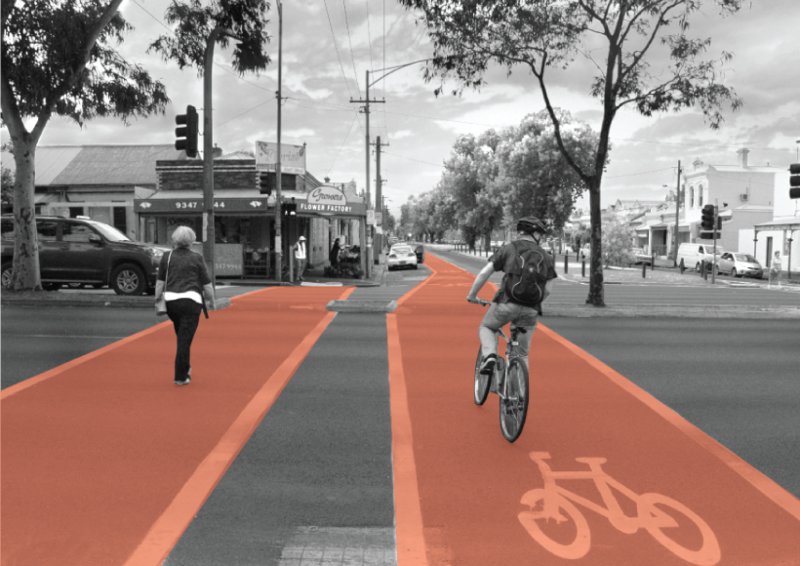 The diverse needs of pedestrians and cyclists – children and young people, older people and those with a disability who may be using mobility aids – require inclusive design solutions..
Austroads 'Guide to Road Design' provides technical guidance for path design. 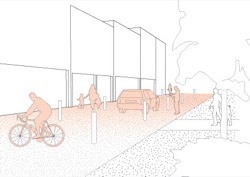 Establish a continuous system of pedestrian paths connecting neighbourhoods, along all streets, continuing through public spaces, and to activity centres and public transport nodes. Include pedestrian paths on both sides of local streets and major roads. Where low levels of pedestrian and bicycle activity are expected, install shared paths for pedestrian and bicycle movement. 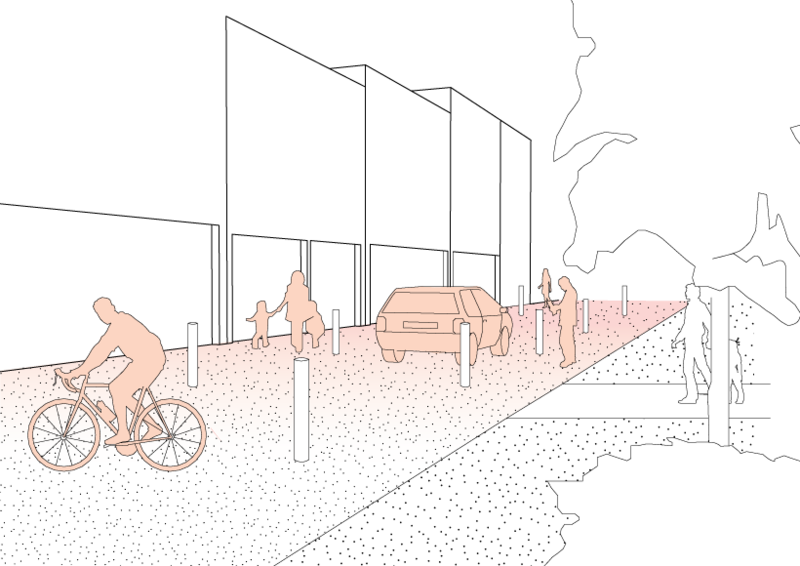 Where high levels of pedestrian and cycle activity are predicted, install mode separated paths for pedestrian and bicycle movement. 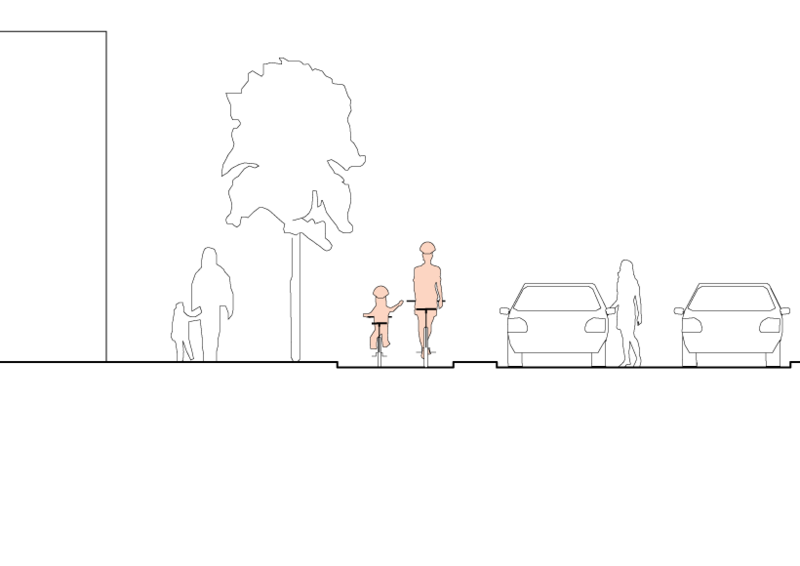 A shared path is not appropriate where high volumes of pedestrian and bicycle traffic are expected. 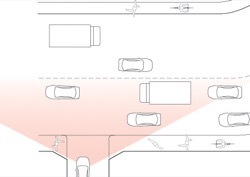 See Guideline sources and references for VicRoads’ Traffic Engineering Manual Vol 1, Chapter 5 for traffic volume triggers. 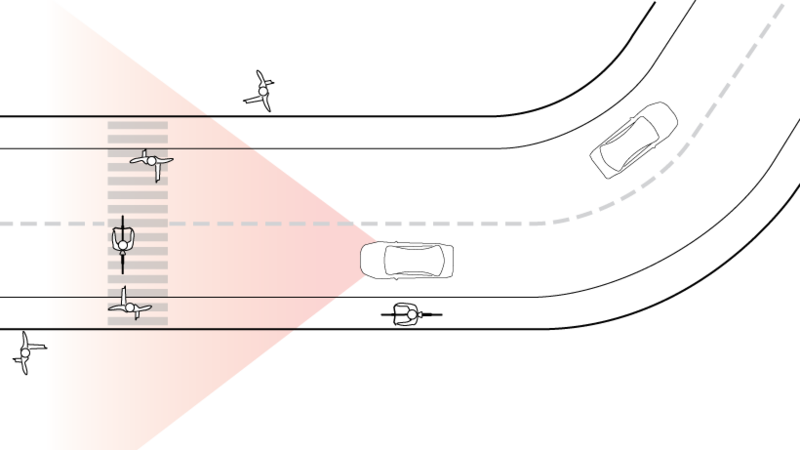 Where high levels of cyclists are predicted, locate kerb separated bicycle lanes on the kerbside of an on-street parking lane. Kerb separated bicycle lanes, such as the ‘Copenhagen’ style bicycle lanes, are safest where few crossovers to properties or cross-streets will intersect with the bicycle lane. 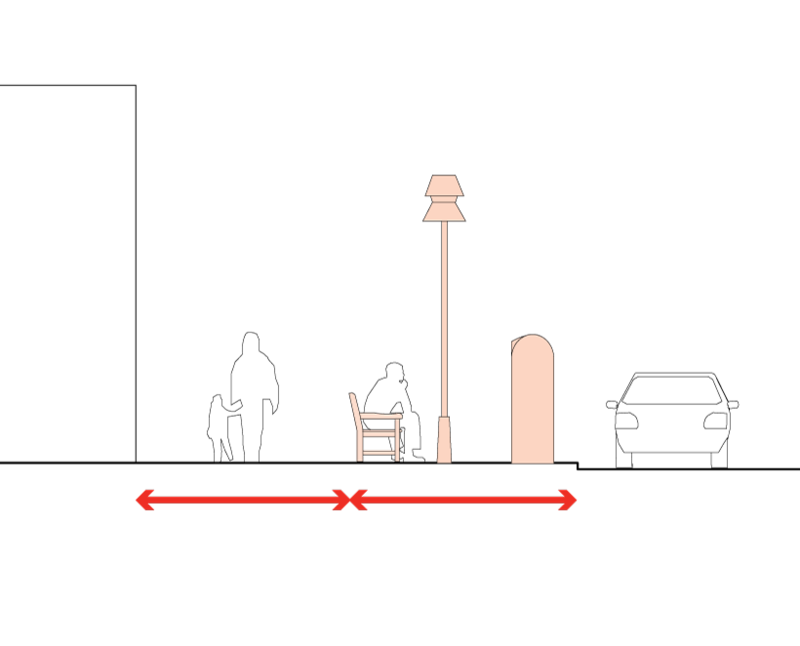 In designing a path, consider the functions the path will perform and the variety of people who may use it, including people with wheelchairs or prams. 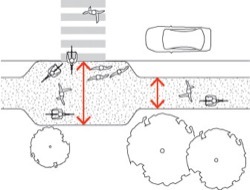 Set the path width to accommodate the anticipated or predicted levels of pedestrian and bicycle traffic. 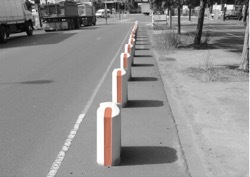 Allow for additional verge width to accommodate the space required for street furniture, facilities and infrastructure. Preserve a minimum height of at least 2.5m above the path that is clear from overhanging objects. Overhanging objects, trees, wires or signs can reduce the functional height of a path, and can be a hazard to pedestrians and cyclists. On shared paths, allocate additional width for passing places and crossing places. Where bicycle paths curve, set an inside radius of at least 15m and preferably 30m. 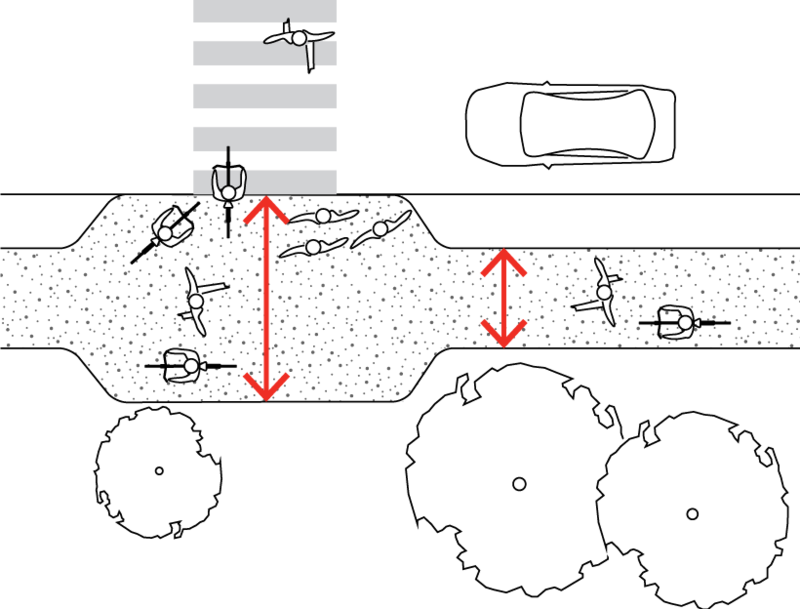 Cyclists rely on forward motion to maintain balance. Slowing for sharp turns can unbalance inexperienced riders. 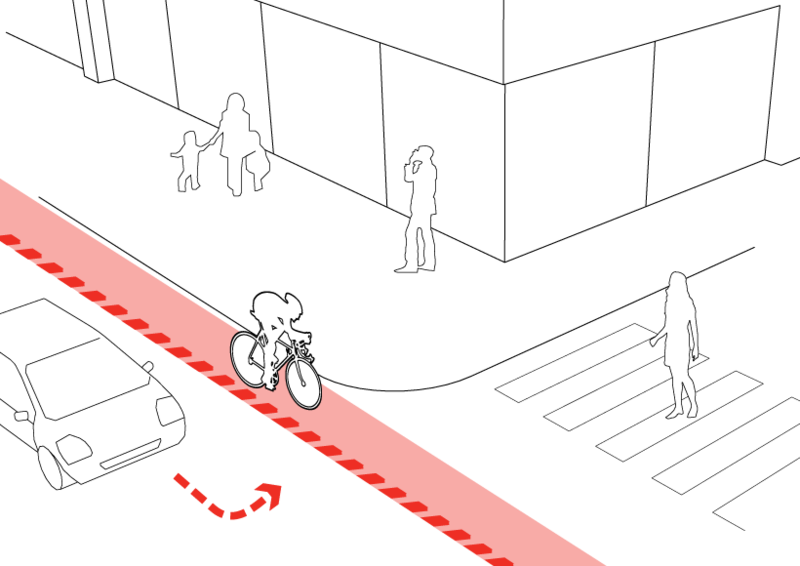 Lay out paths to allow pedestrians and cyclists clear sightlines for a distance of at least 15m ahead. The clear distance provides a view line to potential threats or hazards, such as hiding spots or oncoming and crossing traffic. Where bordered by fences, set pedestrian or bicycle paths to be greater than 3m wide, and with a straight, or near to straight alignment. Paths may need buffer space along sides where there are obstacles or hazards. 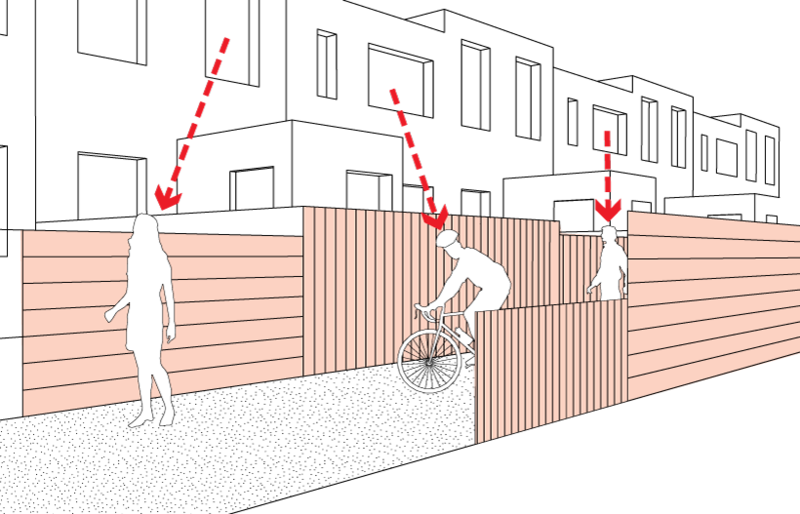 Where bordered by fences, arrange pedestrian or bicycle paths with opportunities for informal surveillance from adjacent properties. Paths bordered by fences or walls can feel unsafe, particularly in areas of low activity. Wider view lines and buildings overlooking pedestrian paths provide a sense of safety. Minimise abrupt level changes along pedestrian and bicycle paths. Grade the surface of pedestrian and bicycle paths to shed water readily and locate drainage pits outside of the travel path. 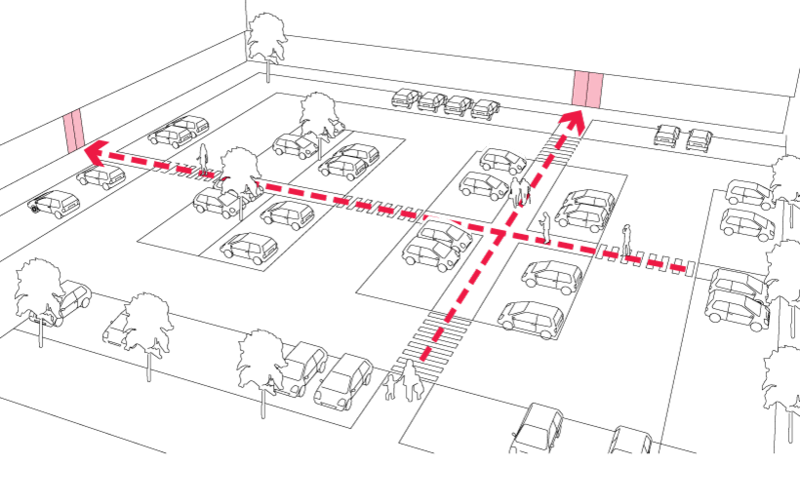 On busy or long distance paths, provide shade and shelter, way-finding signs and frequent seating. Provide formal seating at regular intervals along major walking routes to assist those who need to pause or rest. 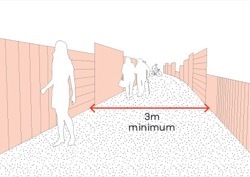 Seating placed at 100m intervals provides a comfortable stopping distance for less able walkers. Provide directed, low-glare lighting to pedestrian and bicycle paths along streets. Ensure street lighting illuminates pedestrian paths, not just the roadway. Vehicle crossovers and entries to laneways can pose a risk to pedestrians and cyclists, both as trip hazards and vehicle collision hazards. For the design of vehicle exits from buildings see Element 5.4 Car parking structures, and for car parking lots see Element 2.8 Car parking lots. Minimise the number of vehicle crossovers that intersect pedestrian and bicycle paths. Locate essential vehicle crossovers on straight street sections in areas of high visibility to approaching pedestrians and cyclists. Provide path treatments across vehicle crossovers to signal priority for pedestrians and cyclists. Vehicle crossover surface treatments such as raised ‘bump-over’ paths, rumble strips and coloured path surfaces alert drivers to the presence of pedestrians or cyclists. Set pedestrian and bicycle paths back from the roadway or other obstructions. Set planting and trees well back from pedestrian and bicycle path edges. 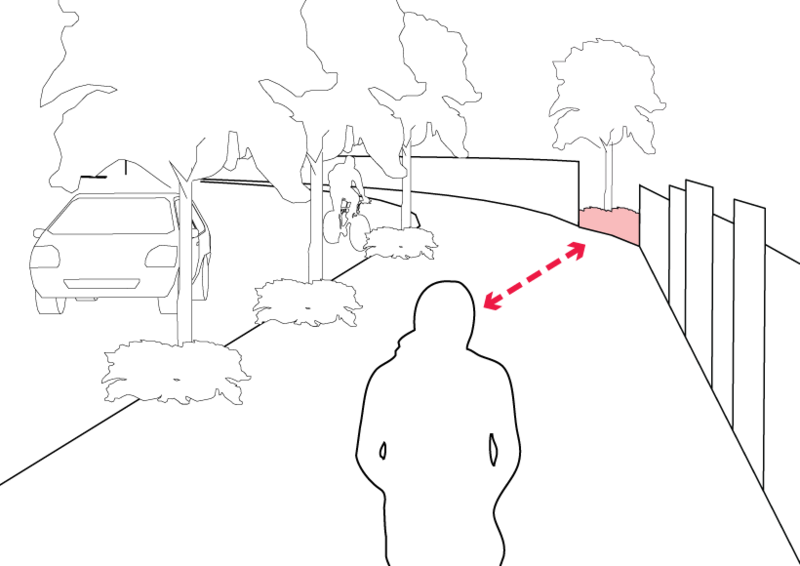 Where dense shrubbery and planting is close to a path, it can provide potential concealment opportunities for attackers. This is a particularly high risk on off-street pedestrian and bicycle paths. Design fences and barriers along bicycle lanes or paths to limit snagging handlebars or pedals, spearing injuries or collision. Bollards, picket fences and log barriers pose a hazard to cyclists. See 6.4 Barriers and fences. Provide fences and barriers with reflective surfaces and light colours. Reflective treatments or light colours can enhance visibility of fences and barriers at night. Maintain clear sightlines along paths and remove obstructions from areas adjacent to pedestrian and bicycle paths. See Guideline sources and references for VicRoads Supplement to the Austroads Guide to Road Design. Implement a path maintenance program to preserve firm path edges, keep gravel paths compacted and remove loose material, trip hazards or debris from path surfaces. Monitor pedestrian and cyclist numbers and safety on paths to inform future improvements to pedestrian and bicycle paths. 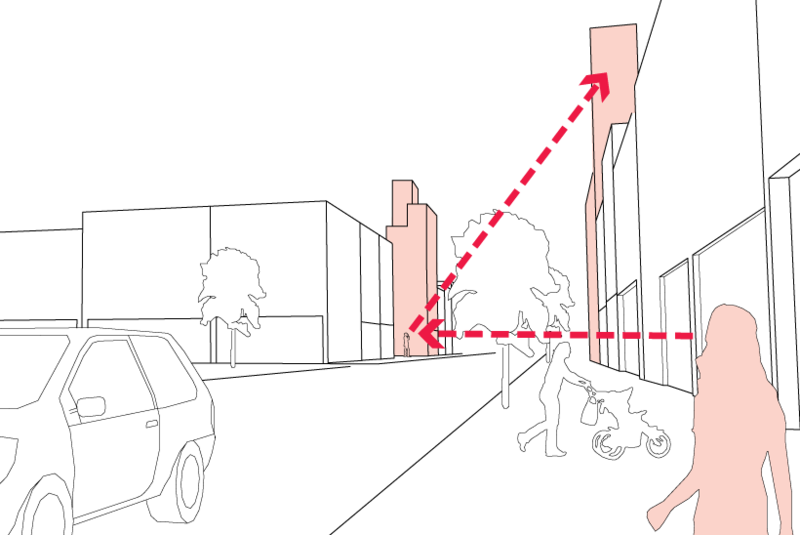 onsult with users when locating or modifying pedestrian and bicycle paths. The parts of the movement network that allow pedestrians and cyclists to safely cross roads and other barriers. Pedestrian and bicycle crossings provide points to safely and conveniently cross roads and streets, or other barriers such as motorways, railway lines or waterways. Many crossings are located on paths to activity centres and schools, or at stations, bus or tram stops. Crossings are either at-grade or grade-separated. At-grade crossings may have road markings and surface treatments, traffic signals and signs, or barrier gates. Grade-separated crossings include pedestrian bridges, overpasses, subway underpasses, or stairs and lifts. Pedestrian and bicycle crossings are critical for safe, easy movement around cities and towns. Crossings concentrate pedestrian and cyclist movement to specific locations where they can safely cross the road or barrier. Where crossings are poorly located, say away from movement desire-lines, or with interrupted sightlines to the approaches or crossing, it may be perceived as an inconvenience or safety risk, and not be used. Austroads Guide to Road Design provides technical guidance for crossing design. Locate pedestrian and bicycle crossings on direct, desirable routes to destinations such as schools, parks, activity centres and public transport stops, or that link neighbourhoods. People often seek a direct route to their destination, even where this involves dangerous informal crossings of busy roads or railway lines. 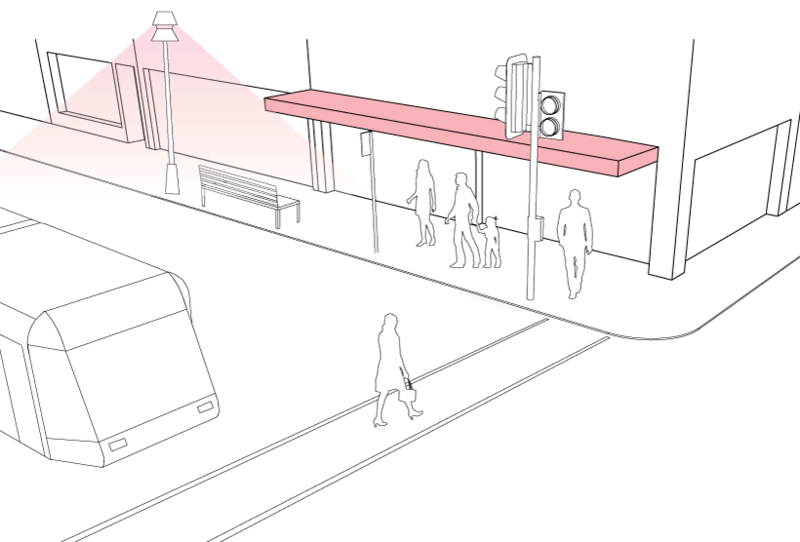 Co-locate pedestrian crossings and bicycle crossings, but provide each mode with a separate crossing path. Road crossing points can become congested with waiting and crossing pedestrians and cyclists. Separating the waiting and crossing traffic is a safer practice. Incorporate lighting on approaches to and at pedestrian and bicycle crossings. Clearly signpost upcoming crossings and intersections to alert pedestrians, cyclists and drivers. Maintain clear sightlines on the approach to and at pedestrian and bicycle crossings. 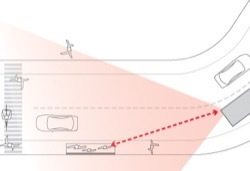 Locate at-grade crossings on roads where pedestrians and cyclists can be seen by approaching drivers. Drivers must be able to see waiting or crossing pedestrians	and cyclists. Crossings should not be located on road curves or hill crests that reduce sightlines to the crossing. Where both pedestrian or bicycle traffic and vehicle traffic levels are high, provide formal controlled road crossings. Provide a clear space for pedestrians waiting to cross a road, separate from the through pedestrian path. 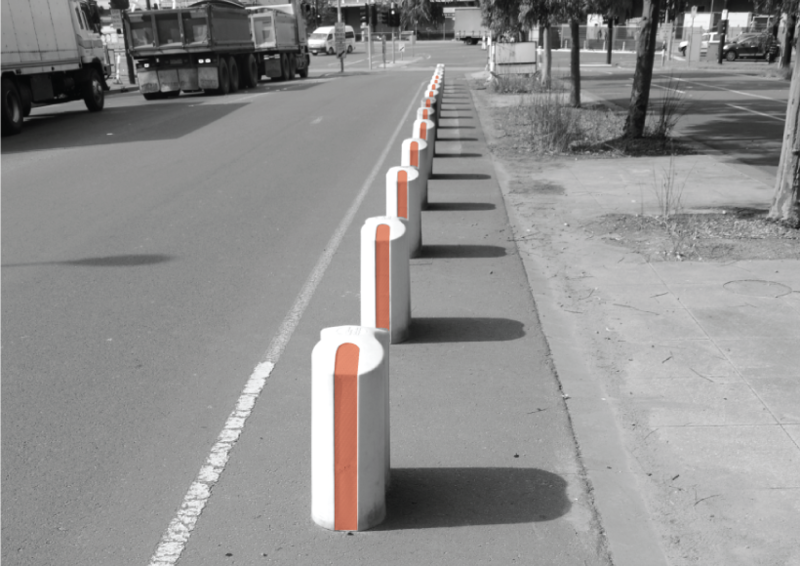 Provide pedestrians and cyclists with the shortest practical road crossing distance. Where roadways are wide, install pedestrian and cyclist refuges such as kerb outstands, traffic islands, and median strips. 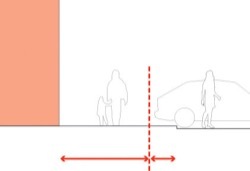 Kerb outstands and mid-street refuges can shorten the pedestrian crossing distance and allow a staged crossing. 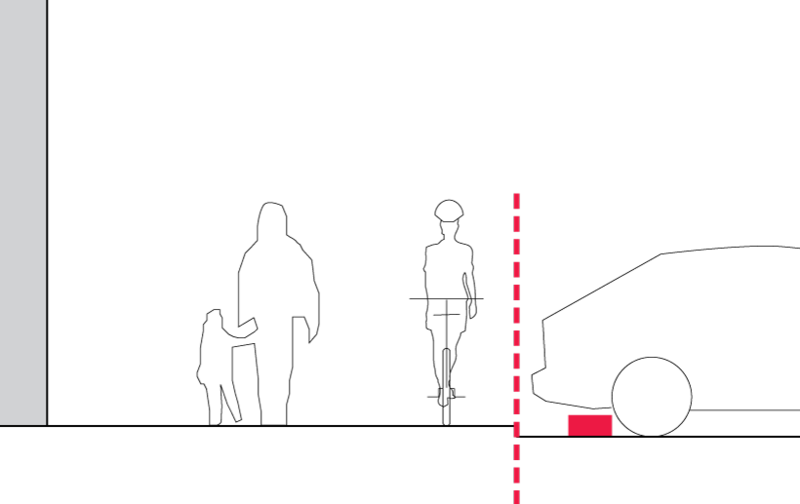 Provide pedestrian refuges of sufficient area, width and length to accommodate the projected numbers of waiting pedestrians and cyclists. Cyclists require refuge space for bicycles of up to 1.8m length, and larger for tandem and child buggy attachments. Where kerb outstands, traffic islands, or median strips are used at crossings, keep the path clear of obstructions. Position crossing request buttons for ease of use by both pedestrians and cyclists. Where pedestrian paths or bicycle lanes cross a left turning vehicle path, provide road pavement detail to alert drivers. A road pavement detail may be a rumble strip, a coloured road surface, or a raised road section. Grade-separated crossings, while safer than at-grade crossings, can involve longer travel distances and crossing times so that pedestrians and cyclists might choose not to use them, and to cross barriers informally at risk to themselves and others. Locate grade-separated crossings of rail lines, motorways or waterways on direct, desirable routes to schools, parks, activity centres and public transport stops. 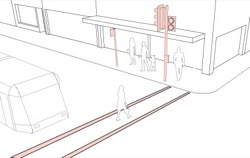 Grade-separated crossings are most suitable where the topography minimises the length of ramps required. Locate grade-separated crossings adjacent to active uses that can provide opportunities for informal surveillance of the approach path and the crossing. 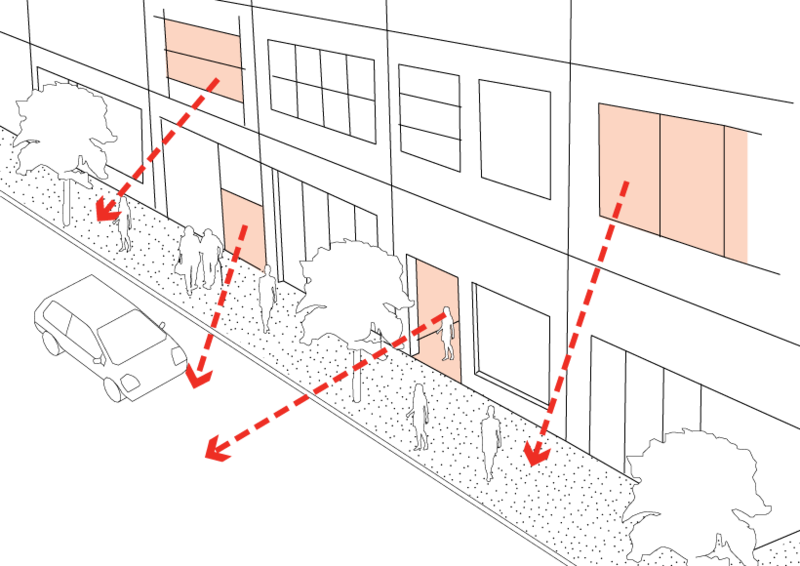 An active use may be a busy public space, or a building with people coming and going and with overlooking windows. Provide grade-separated crossings with wide straight paths, clear sightlines and adequate lighting. 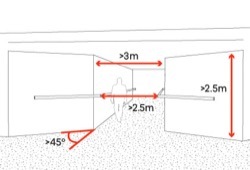 Paths that are narrow or with few ‘escape route’ options, such as bridges, underpasses, stairways, lifts and walk- throughs, can feel unsafe and can increase opportunities for entrapment. Construct grade-separated crossings with a width greater than 3m, with a minimum of 2500mm between handrails, an unobstructed height no less than 2500mm, exit splays of 45 degrees, and clear sightlines for 15m. see Guideline sources and references for link to Austroads guidance. Continue the approach path width for the full length of the underpass or bridge. To manage pedestrian and bicycle crossings to respond to local conditions. Monitor pedestrian and cyclist numbers and safety at pedestrian and bicycle crossings to inform management and improvements. Management can include adjusting traffic light controls to respond promptly to the presence of pedestrians. Consult with users when locating pedestrian and bicycle crossings. Local communities have detailed knowledge of user behaviour, needs and preferences regarding crossing types and locations. 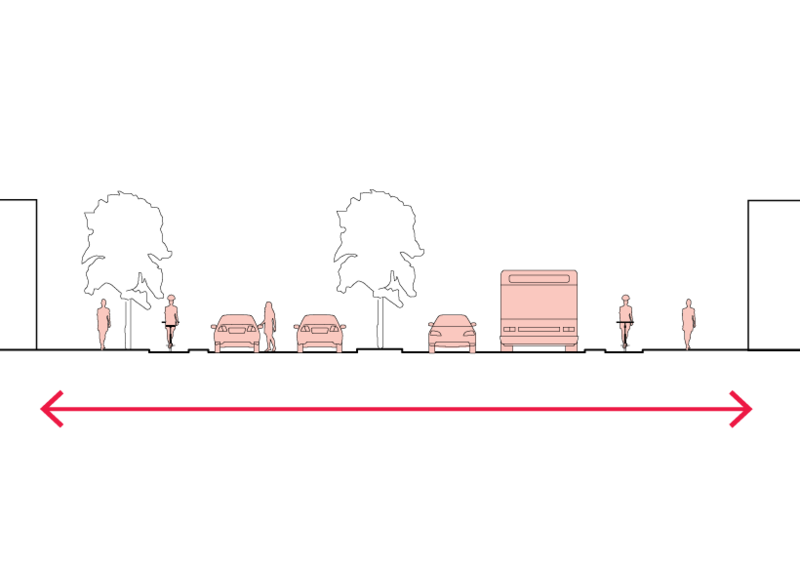 The pedestrian and bicycle paths adjacent to roads with high volume, high-speed vehicle traffic. Major roads accommodate high volumes of motor vehicle traffic including public transport and freight, and have higher design speeds (60–100 km/h). Major roads can have two or more traffic lanes in each direction and may provide for on-street car parking, bus lanes or tram tracks, bicycle lanes, as well as verge space for pedestrian paths, infrastructure and landscaping. Major roads may be identified as priority routes for public transport, motor vehicle traffic or freight. Larger major roads that are declared arterial roads are managed by VicRoads. Pedestrians and cyclists, while accommodated on these roads, may be given a lower priority in terms of access and amenity while maintaining a high level of safety. A section of an arterial road through an activity centre or school zone may have lowered design speeds. Major roads carry large volumes of people and goods over longer distances. While they provide connections between major centres of population, regions and transport terminals, they also function as local area connections for all modes. Major roads sometimes lie within centres of high activity, where they may function as pedestrian priority routes to pedestrian priority places with periods of lowered traffic speed limits for a section of their length. This element focuses on safe and convenient travel for pedestrians and cyclists on major roads. This element does not cover design of motorways and railways. VicRoads is a referral authority for all landscape treatments and works adjacent to arterial roads. Provide separate paths for pedestrians and cyclists travelling beside major roads. Bicycle paths along major roads may cater for commuter cyclists as well as school children and recreational cyclists. See Element 2.3 Pedestrian and bicycle paths. 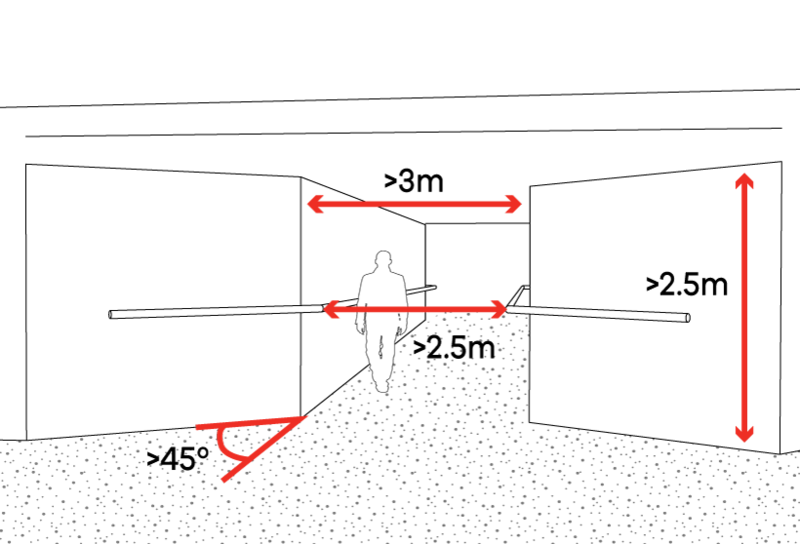 Position pedestrian and bicycle paths to achieve clear sightlines along paths and from the roadway to the path. 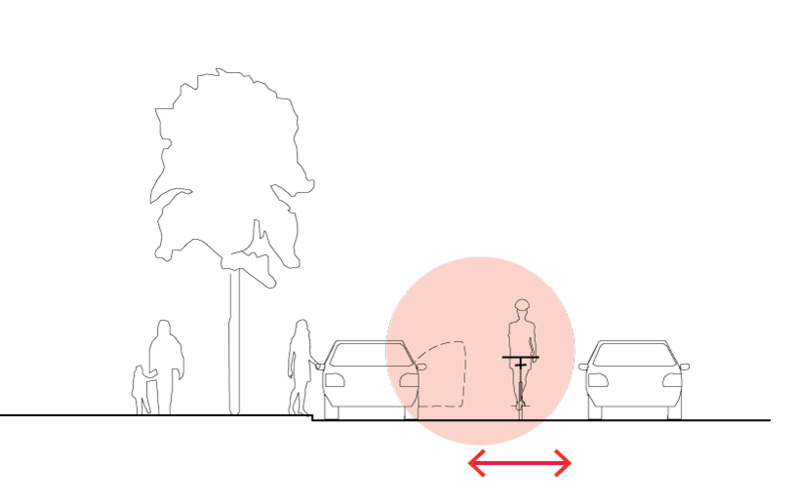 Landscape elements such as trees, fences or earth mounds can provide safety and amenity to pedestrians and cyclists travelling alongside major roads so long as road safety and opportunities for informal surveillance are maintained. Where major roads are bordered by existing rear fences and walls, provide pedestrian and bicycle paths with clear sightlines to visible exit paths. 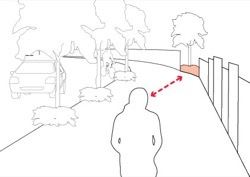 Isolated paths bordered by blank walls or fences and with few opportunities for ‘escape routes’ or for informal surveillance from overlooking buildings can feel unsafe and can increase opportunities for entrapment of walkers. Provide for noise attenuation and safety treatments on pedestrian and bicycle paths along high noise, high-speed, high-volume major roads. Provide safe and direct pedestrian and bicycle crossings on major roads. See Element 2.4 Pedestrian and bicycle crossings. Locate public transport stops and pedestrian approach paths on major roads where there are opportunities for informal surveillance. Provide safe and direct crossings of major roads in locations that enable pedestrians of all abilities to reach public transport stops. See Element 2.4 Pedestrian and bicycle crossings and also see Element 2.6 Public transport on roads. 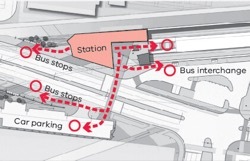 The stops and access routes to trams and buses. There are two main types of public transport that use the road network: the fixed tram network, which is usually located on major roads and streets; and the bus network, which operates within standard traffic lanes or in bus priority lanes. Bus and tram priority routes have priority over general traffic. Public transport on roads helps move large numbers of people around a city, taking them to work, school, shopping or other activities. This sub-element focuses on providing people with convenient access to public transport on roads. The engineering, servicing or management issues of the public transport are guided by other appropriate authorities. See also Public Transport Guidelines for Land Use and Development (Department of Transport 2008) and also Guideline sources and references for a list of technical guidance. Public transport stops may be located on the road, kerbside or on centre road refuges. Co-locate public transport stops with controlled pedestrian crossings or controlled intersections. If a public transport stop is near a traffic hazard, use traffic calming measures to maximise pedestrian safety. Where a stop is not at a controlled intersection, locate the public transport stop where pedestrians of all abilities can safely cross the road. Locate public transport stops to enable approaching pedestrians and public transport drivers to see the stop. Sharp curves in the roadway can pose a hazard for pedestrians as car drivers’ sight lines are limited. Where possible, integrate shelters for public transport stops into the facade of adjacent buildings. 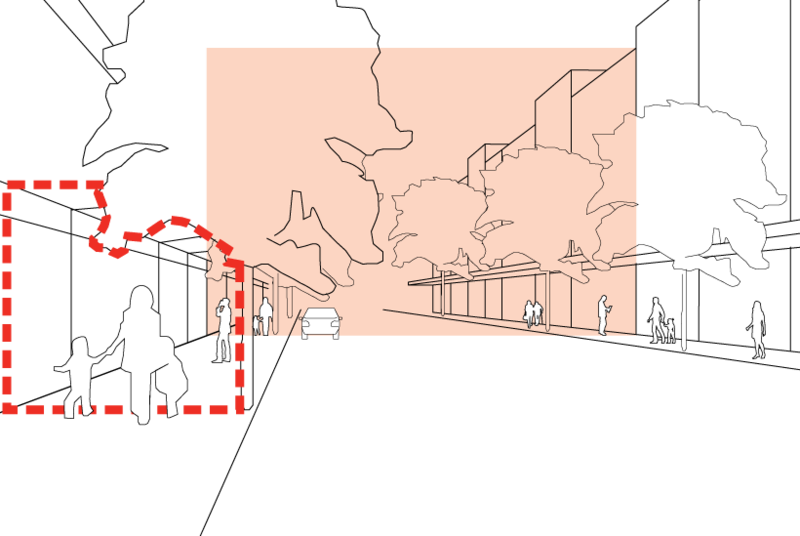 Integrating shelters, by attaching them onto the building wall, allows the street spaces to remain uncluttered. 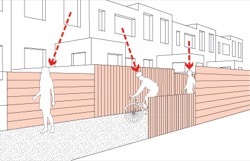 Building Code of Australia sets out design standards for building projections beyond the street alignment. See Element 5.1 Buildings in activities areas, and Element 6 Objects in the public realm. Provide seating at public transport stops. Provide adequate lighting on pedestrian approach paths to public transport stops. 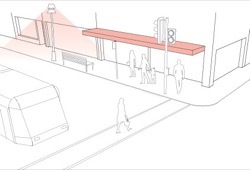 Provide lighting at public transport stops to levels that enable public transport drivers to see waiting passengers. 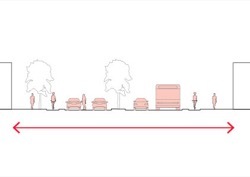 Provide direct, convenient pedestrian links from neighbourhoods to public transport stops. Provide direct, convenient pedestrian paths connecting between public transport modes. An integrated public transport service should provide efficient, safe pedestrian paths connecting public transport modes. 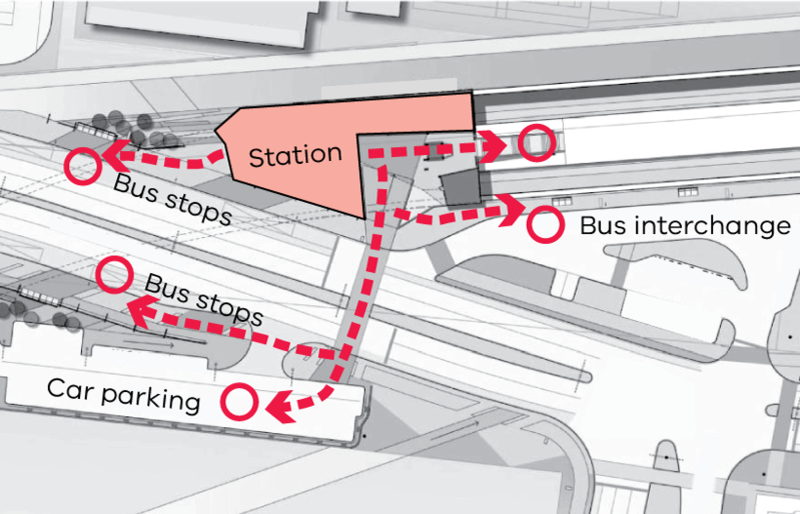 Position bus and tram stops at locations that have higher numbers of passers-by. Public transport stops in remote locations receive fewer passers-by and less informal surveillance. Locate public transport stops where they are visible from nearby buildings. 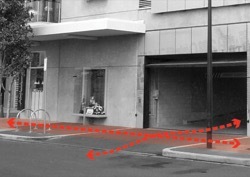 Locate approach paths to public transport stops where the paths are visible from nearby buildings. To maintain the amenity of public transport stop environs. Maintain public transport stops and surrounds in a clean, safe and well-lit condition. Ensure damaged shelters, furniture, paving or landscape elements are promptly repaired. Convenient, commercial vehicle and casual car parking close to local destinations. On-street car parking is part of the movement network. On-street parking provides convenient, short-term parking in close proximity to activities and destinations. 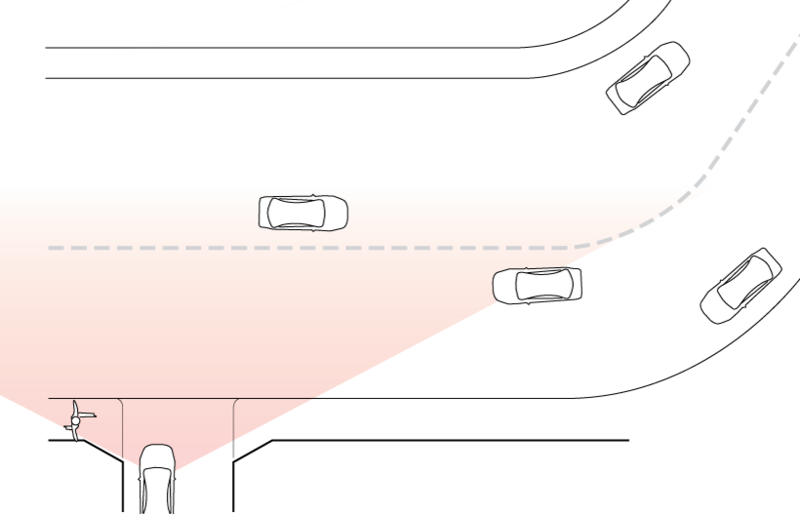 On-street parking may be parallel, indented, angled, at kerbside or in centre-road islands. 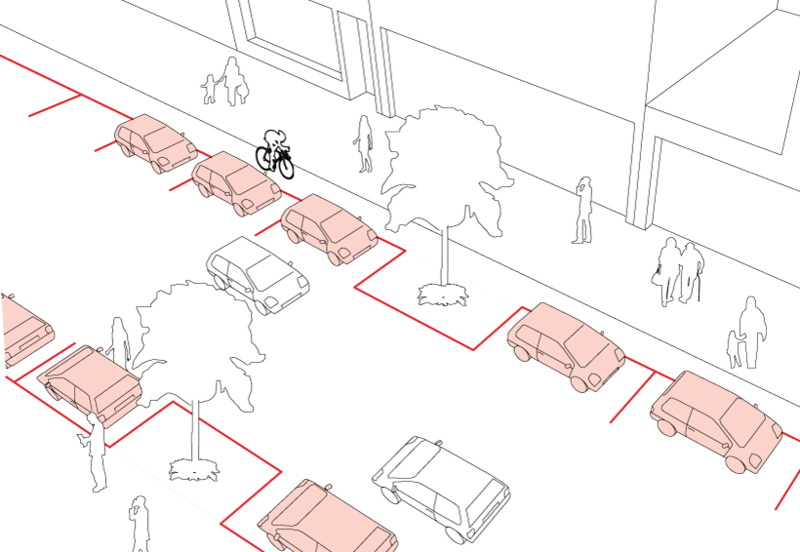 The street type and use pattern determines the appropriate type of on-street parking used. It plays an important role in inner urban areas with limited off-street parking. The presence of on-street parking can affect driver behaviour by reducing vehicle speeds. Parking manoeuvres can interrupt and calm traffic flow, providing additional opportunities for pedestrians to cross a road. The presence of parked cars can make a street feel more inhabited. Well-managed on-street parking can provide a good service with a minimal number of car parking spaces. The civil design of on-street parking is guided by Australian Standard AS 2890.5 – 1993, Parking Facilities Part 5: On-street Parking. 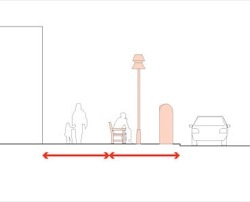 Provide a street cross-section that accommodates the appropriate type of on-street parking. 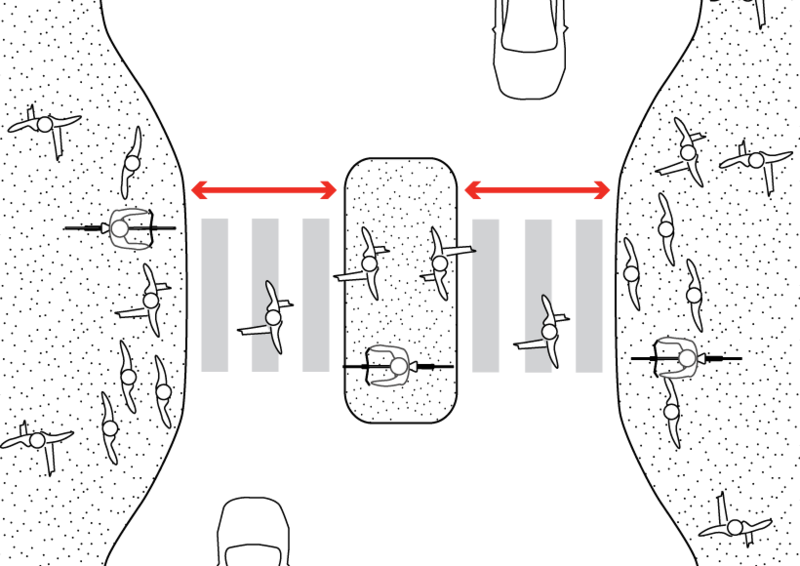 Different types of on-street parking are appropriate for different street types: angle or centre road parking requires wider streets; parallel parking is more appropriate in narrow streets. 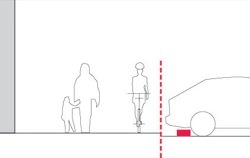 Arrange kerbside and indented parking on streets as part of the buffer zone between pedestrians and moving traffic. If no on-street parking is provided, ensure traffic speeds are managed to achieve a sense of safety for pedestrians. 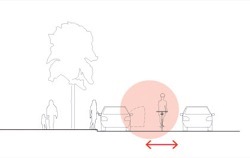 Separate angled on-street parking bays from pedestrian and bicycle paths. Wheel-stops can prevent cars in angled parking bays from overhanging paths. The normal vehicle overhang allowance is 1m. Design high turnover, short-stay on-street parking spaces to provide ‘forward only’ vehicle movement into and out of the parking space. ‘Backing out’ in high turnover on-street parking areas (e.g. rail stations, schools or convenience stores) can pose a hazard for pedestrians, particularly children. 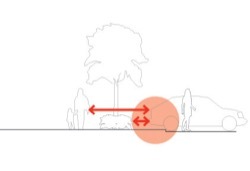 Incorporate landscaping into kerbside, angled and centre road parking. 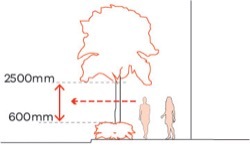 Street trees can be incorporated into kerb outstands, centre road islands or in-road planters. In-road planters may be a practical way to avoid trees conflicting with footpaths and utilities. They can also capture and use stormwater. Limit vehicle crossovers in areas where on-street parking is essential. 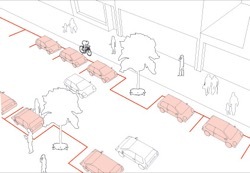 Vehicle crossovers reduce the space available for on- street car parking. 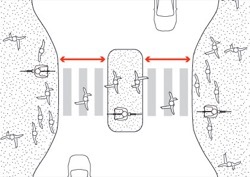 Where on-street parking is adjacent to on-road bicycle lanes, allow a safety strip width for opening car doors and the safe passage of the cyclist. 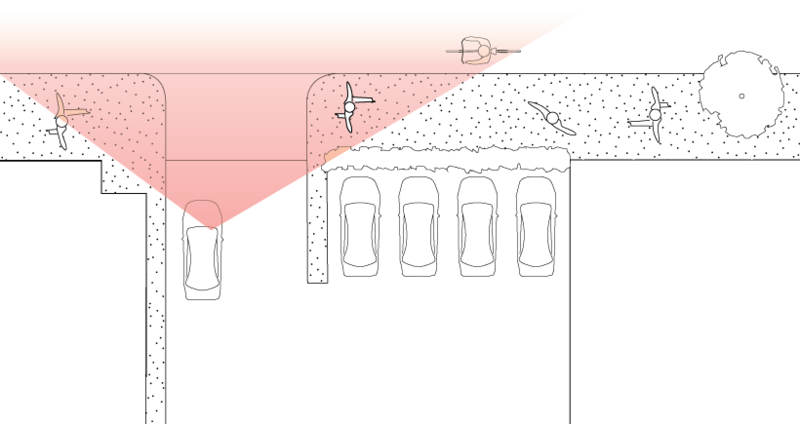 The safety strip width will depend on the street’s traffic speed and type. 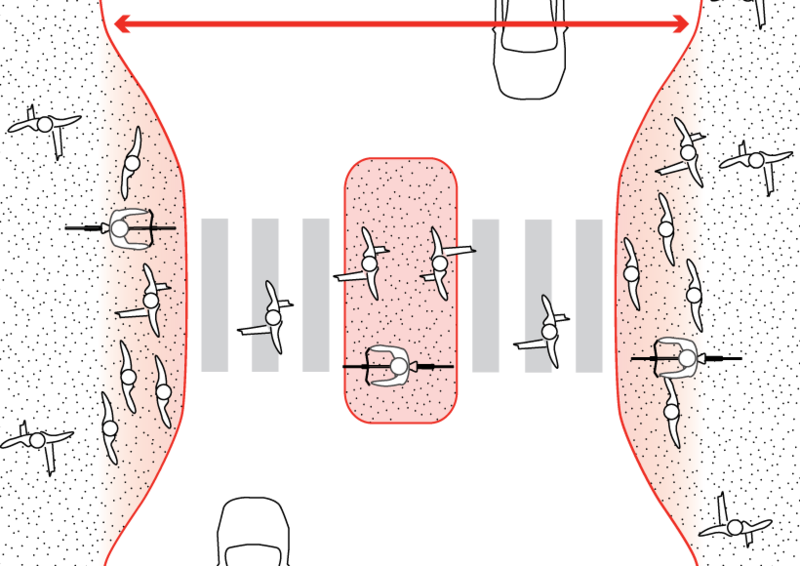 Car and truck doors opening into bicycle lanes are one of the major causes of cyclist crashes. Delivery trucks have poor sightlines and their open rear doors can intrude into bicycle lanes causing a hazard to cyclists. 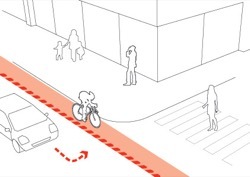 Where on-street parking is adjacent to on-road bicycle lanes, provide line-marking or a kerb to separate mode spaces. 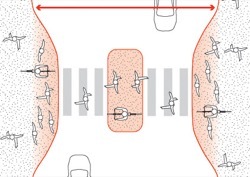 Providing marked or kerbed lanes and wider parking spaces allows better sightlines between a driver and cyclist when a car is exiting a parking space. Managing the use of on-street parking spaces is fundamental to on-street parking provision. Some methods to ensure regular turnover of parking spaces are controlling the parking period; parking permits; parking charges; or clearways periods. Some on-street parking spaces can also be converted to bicycle parking as demand increases. Use time limits on parking spaces closest to activity centres to ensure the greatest turnover of the most convenient spaces. 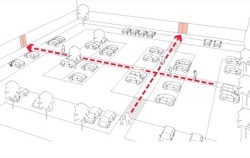 Allocate controlled on-street parking bays for small delivery and service vehicles. Allocate some on-street parking spaces for bicycle parking in proximity to rider destinations. These destinations include schools, cafes and shops. 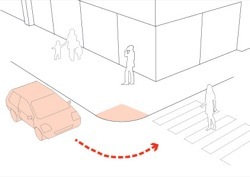 Allocate on-street parking spaces for use by Carshare programs in accessible, well-frequented locations with opportunities for informal surveillance. Set vehicle speed limits in streets to allow safe car parking and exiting movements. Open areas of land used for parking cars. Car parking lots are open areas of land used for parking cars. They can be publicly or privately owned and are generally located in activity centres,at train and bus stations, and other facilities accessed by car. Some higher density residential developments may incorporate private car parking lots. While many car parking lots are open to pedestrian access, dedicated pedestrian paths are not common. Bicycle movement through car parking lots is generally restricted or not permitted. At times, car parking lots may be used for other purposes, such as a market, or for entertainment or sports activities. Car parking lots are important for the convenience of drivers and the viability of some businesses, and in activity centres they provide space for customer parking away from neighbouring residential streets. Where land is freely available and land values are relatively low, car parking lots are often the least costly method of providing parking in urban areas. Car parking lots should be convenient, pleasant and safe for users. As they occupy large areas of land they should be designed not to create barriers for pedestrians. Measures should be taken to minimise the impact of paved surfaces in radiating heat in summer and generating stormwater run-off. After hours and during low demand periods, car parking lots should be managed to ensure they do not attract anti-social behaviour and are safe for users. Locate larger car parking lots to the rear or side of the buildings they serve. Locating larger car parking lots between the street and the building frontage may reduce street amenity and compromise pedestrian access to buildings. Provide car parking lots with opportunities to receive informal surveillance from surrounding buildings and spaces. 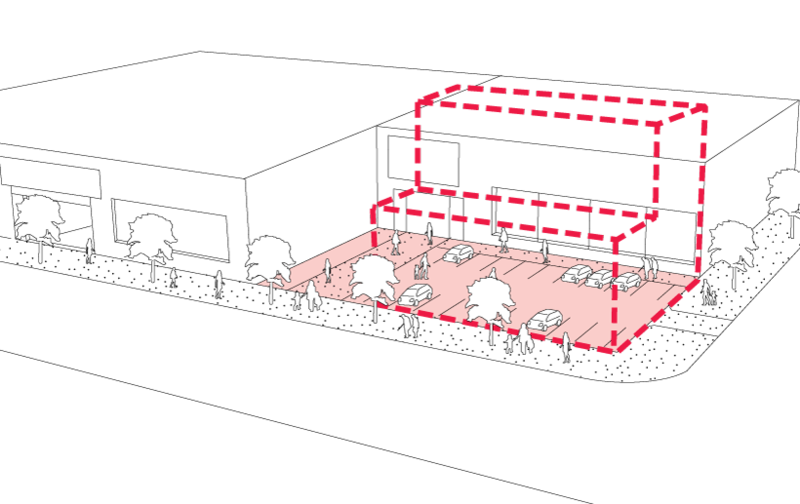 Car parking lots bordered by blank walls or fences enclose the area and reduce the opportunity for informal surveillance. 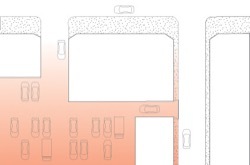 Where a car parking lot must be located between the building frontage and the street, arrange the parking space to maintain a visual connection between the building and the street. A 22m setback allows for two rows of 90 degree parking with single vehicle access way between, landscaping along the street edge and pedestrian paths serving the parking. 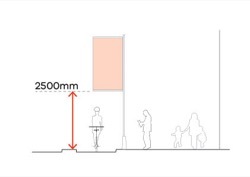 A setback of up to 22m will maintain a visual connection from the building to the street, whereas greater distances can compromise visual connection. Where a car parking lot must be located between the building frontage and the street, arrange the site to allow for future development options. Lay out car parking lots to minimise noise, fumes and lighting impacts into adjacent properties. Pedestrians will look for the most direct route to their destination. 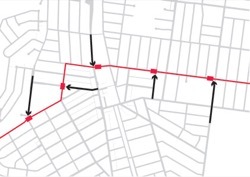 This preferred direct route, called a desire-line, may cross vehicle lanes and garden beds, putting pedestrians at risk and damaging landscaping. In large car parking lots, position dedicated direct paths to take pedestrians from car parking spaces to main building entries. If a car park lies between the building entrance and the street, people need a convenient path from the street to the building entrance. 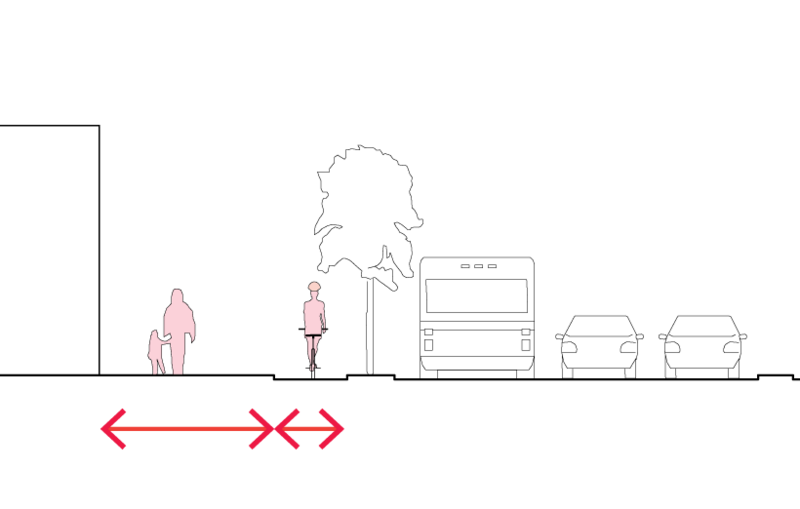 Locate pedestrian paths as close as possible to anticipated pedestrian desire-lines. When direct pedestrian desire-lines are not taken into account, people make their own informal direct path. 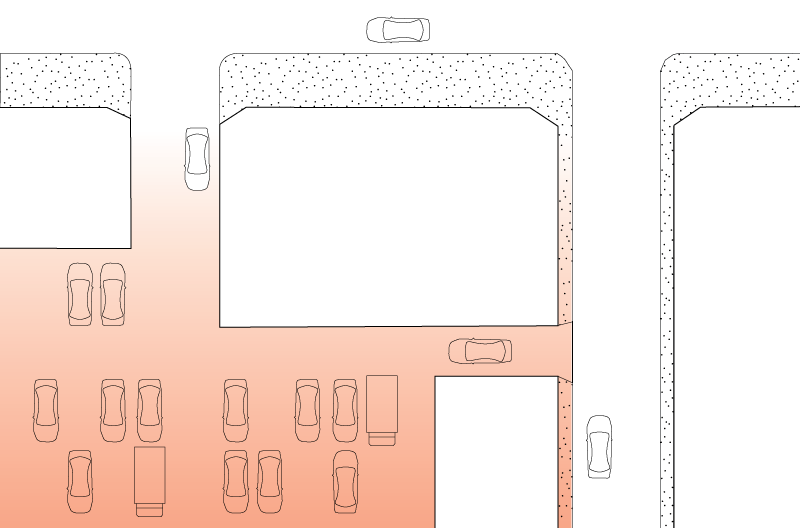 In large, busy car parking lots, orient the parking aisles perpendicular (90°) to the building entrance or other pedestrian destinations. 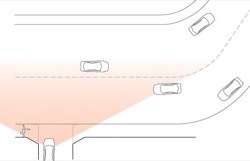 Arrange parking spaces to provide effective sightlines for drivers when turning and reversing. Provide clear sightlines at entries and exits to car parking lots. 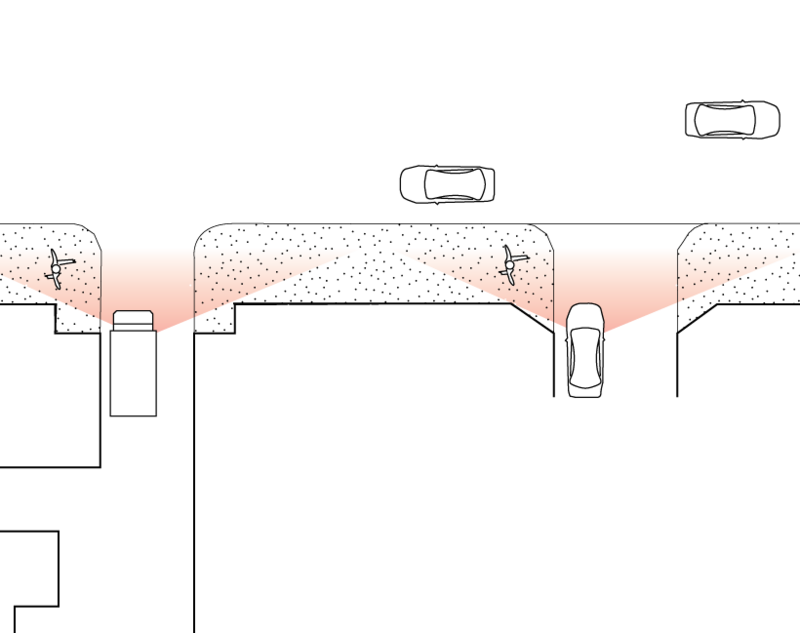 Provide pedestrian lighting in car parking lots that are used regularly at night. 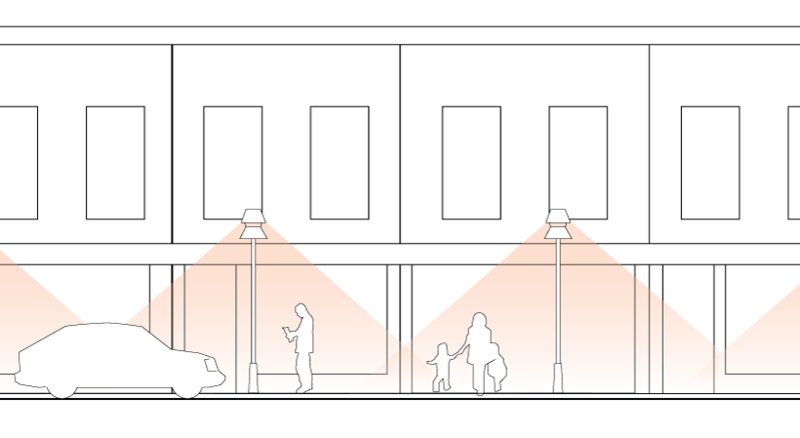 Avoid unwanted light spill onto adjacent properties. 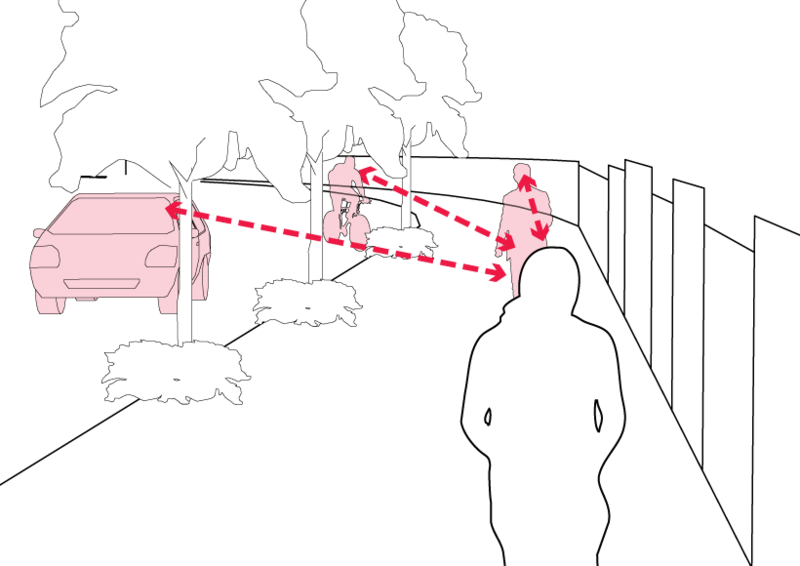 Locate trees clear of lighting to allow direct illumination of paths and vehicle lanes. 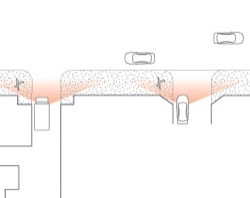 Provide for vehicle overhang areas to be clear of pedestrian paths, trees or shrubs. Pedestrian paths may need extra width to allow for overhang from car bonnets or bumper bars. The normal vehicle overhang allowance is 1m. Construct a permanent kerb for wheel stops. Wheel stops constructed of logs, or kerbs fixed to the pavement with spikes may dislodge under the vehicle causing damage and may also pose a pedestrian trip hazard. Where the risk of damage from vehicles and vandalism is high, protect vegetation for up to four years from planting. 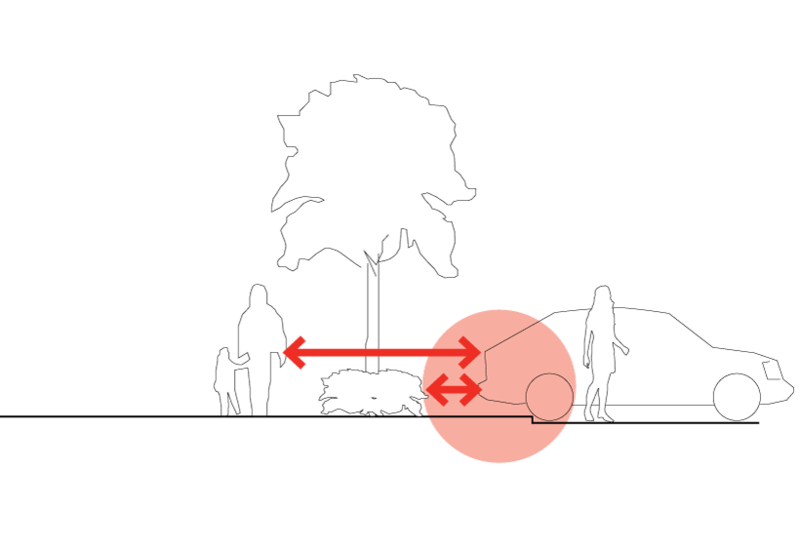 Vegetation can be protected using tree guards, fencing and level changes. Encourage alternative uses for car parking lots during no or low demand periods. 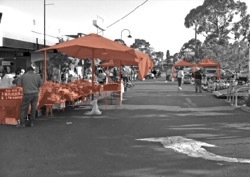 Take advantage of differing periods of demand for car parks by encouraging community activities such as markets and festivals. 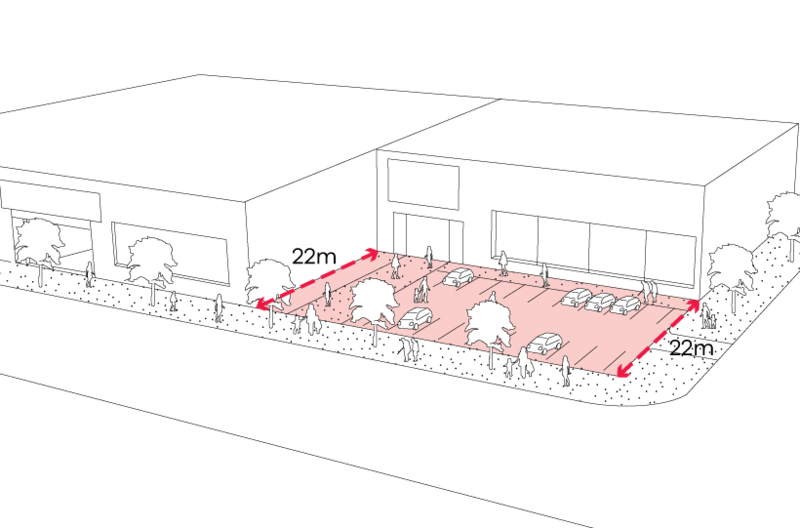 Provide shade to parking spaces and pedestrian paths. 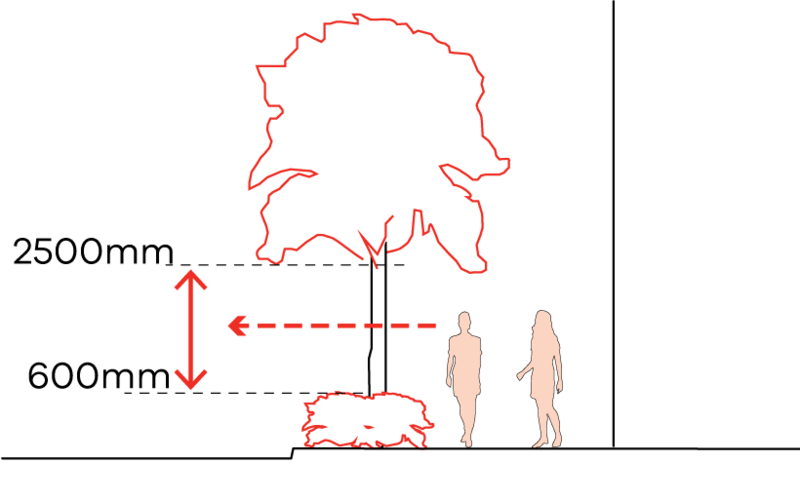 A tree canopy or a shade structure may be used. Landscape a minimum of 15 per cent of the car parking surface area. Larger planting areas with a minimum dimension of 2.5m support tree growth. Small planting areas or narrow strips do not provide sustainable planting conditions. Provide for water harvesting and other on-site water re-use and treatment systems. Water harvesting can provide additional water to plants. See Guideline sources and references.